B 1924 George Fincham & Sons. Reeds by Alfred Palmer & Son. Gt: 8.8.8.8.4.4.2.8. Sw: 16.8.8.8.8.4.4.2.8.8.8. Ped: 16.16.16.8.8. 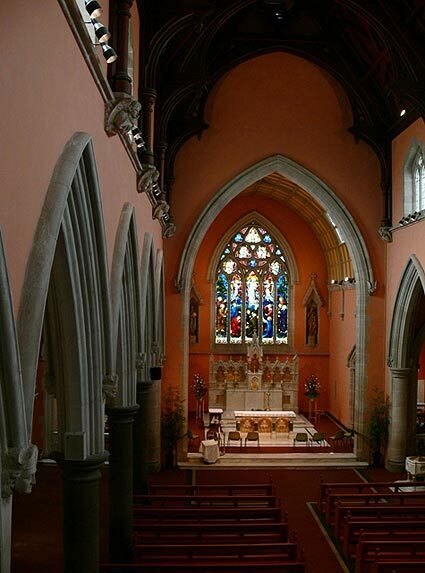 The site of St John’s was granted in 1864 and the foundation stone of the present building laid in 1876. The first portion was opened in 1882 and the completed building opened in 1893. In 1903 the octagonal Lady Chapel was added and the spire completed in 1907. Numerous internal fittings were added in 1923 and the building consecrated in 1924. 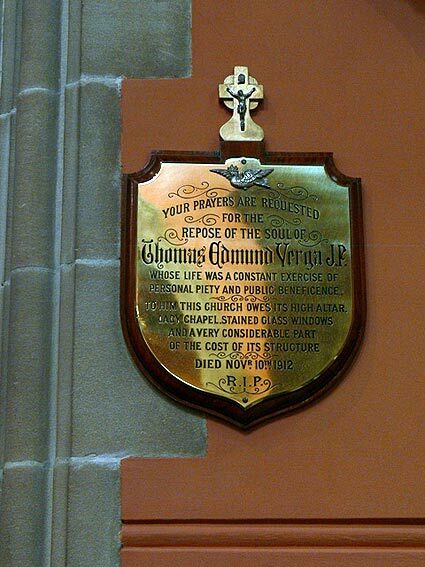 The church was largely erected through the munificence of Thomas Edmund Verga JP, who lived opposite. Verga contributed more than £20,000 of his own funds to the erection of the building, and was conferred by the Pope in 1909 the Cross Pro Ecclesia Dei et Pontifice to honour his contribution. 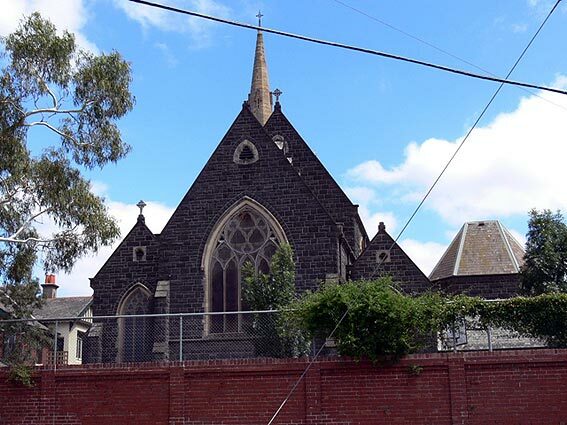 The architect was John Bunn Denny who was born in Norfolk in 1810 and died in Melbourne in 1892. Before emigrating, Denny had erected Alton Towers and St Giles’ Church, Cheadle for A.W.N. Pugin, the great Gothic Revivalist, who strongly commended his work. 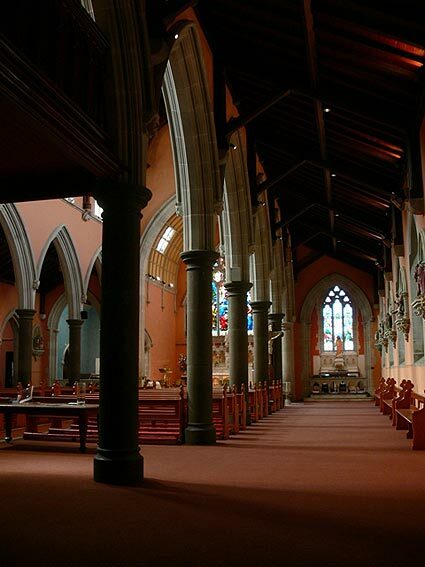 In Australia, Denny was responsible to the Catholic Diocese of Melbourne, often working in conjunction with the distinguished architect William Wardell. 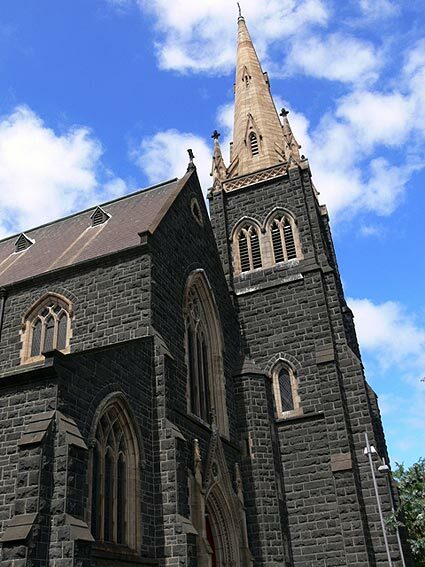 Thus, St John’s bears the stamp of Pugin more strongly perhaps than any other church building in the country and is one of Australia’s finest 19th century parish churches. 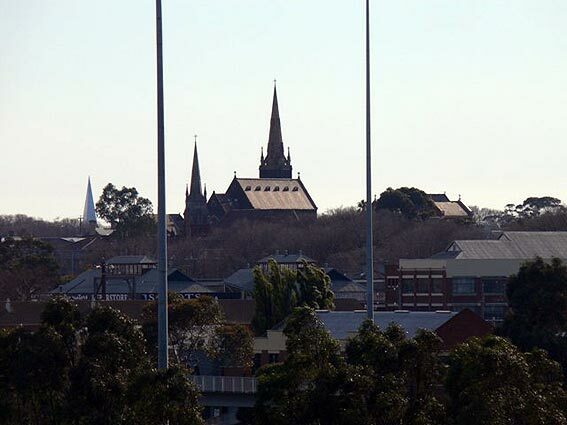 The church is visible from afar and benefits from a well-elevated site. The length of the building is 144ft, width 64ft and internal height 66ft. The spire is 146ft high. It is built from bluestone with freestone dressings. 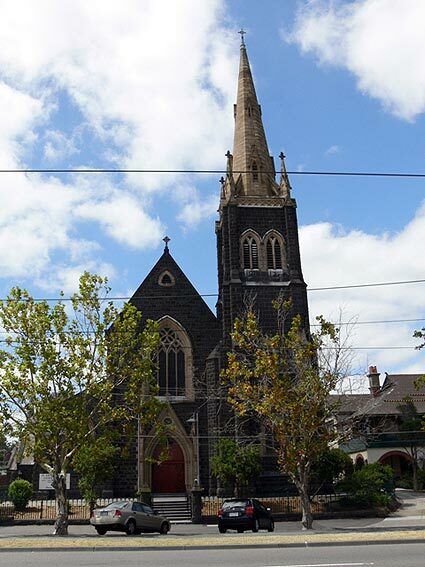 The exterior is dominated by an elegant tower and spire, of Pyrmont freestone, supported on flying buttresses; this appears to derive from an earlier unexecuted design for a tower and spire for St Patrick’s Cathedral, Ballarat, which Denny erected. 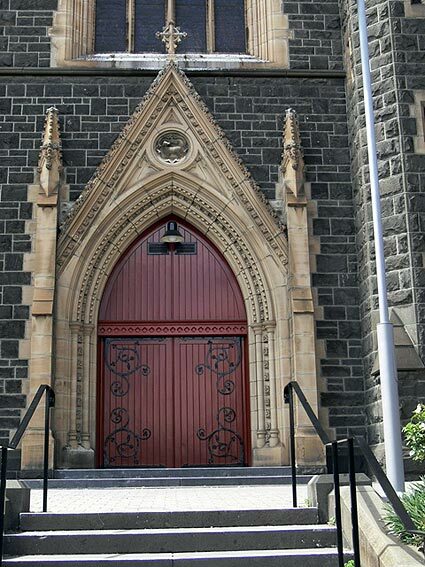 The façade incorporates a large four-light window with elaborate Decorated tracery and a splendid recessed doorway. The exterior includes numerous carved bosses supporting the label moulds of the windows. Internally, the building consists of a very lofty six-bay clerestoried nave, with elegant hammerbeam roof and elaborate trusses and braces, side aisles and porches. The variety of traceried forms in the aisle windows is quite remarkable. 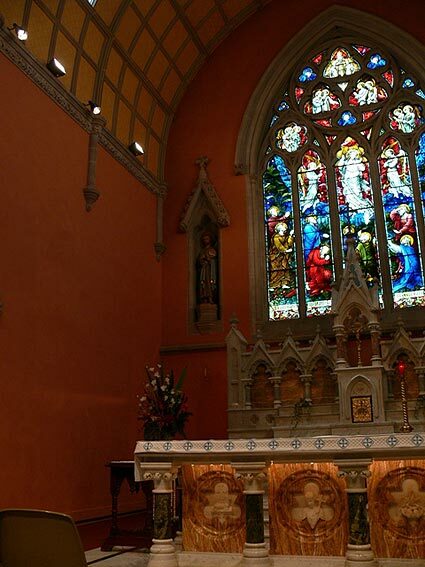 The spacious sanctuary, with panelled ceiling, is flanked by two side chapels, that on the right having an elaborate stone vault similar to a comparable chapel at St Patrick’s Cathedral, Ballarat, also by Denny. To the left, through a small arch, there is the octagonal Lady Chapel. Like the exterior, there is an extraordinary wealth of stone carving including carved corbels of angel musicians supporting the roof beams. 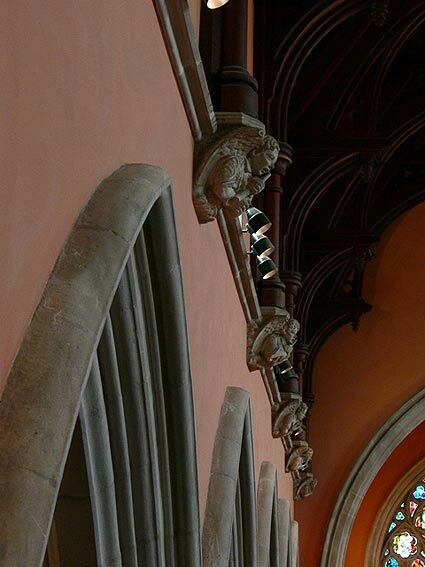 There are statues placed in niches on either side of the east window, in the same manner as St Giles’, Cheadle. The original decoration, which included glowing colours and stencilled ornamentation, was later overpainted and a present restoration and repainting of the interior by David Mulholland has endeavoured to recapture the original vibrancy. 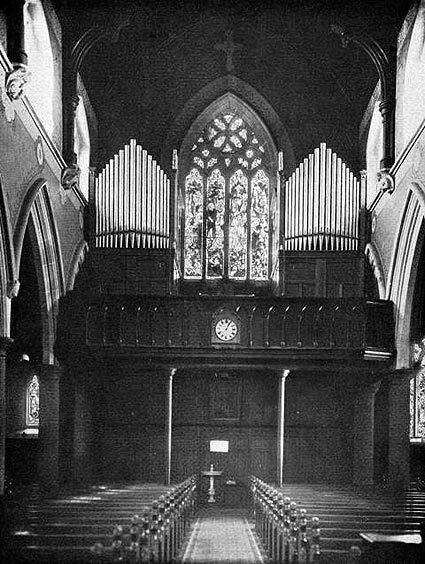 The fittings include stained glass by Hardman of Birmingham (notably the east window and several in the side chapels) and the Melbourne firm of Ferguson & Urie (in the right chapel). There are elaborate marble altarpieces; the table of the high altar has been moved forward in the sanctuary during the recent work. 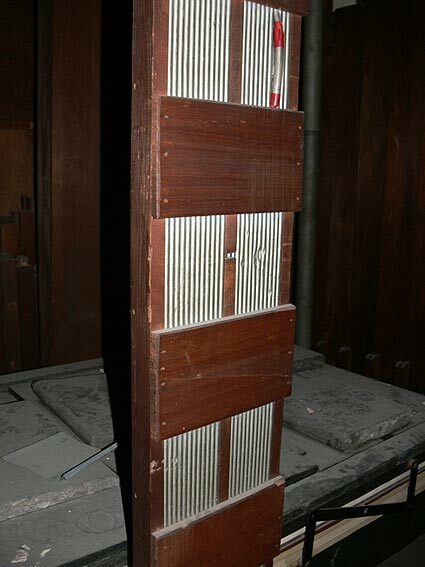 Fincham & Hobday quoted on 12 July 1893 to build a three manual organ of 27 speaking stops and tubular-pneumatic action for St John’s at a cost of £944. 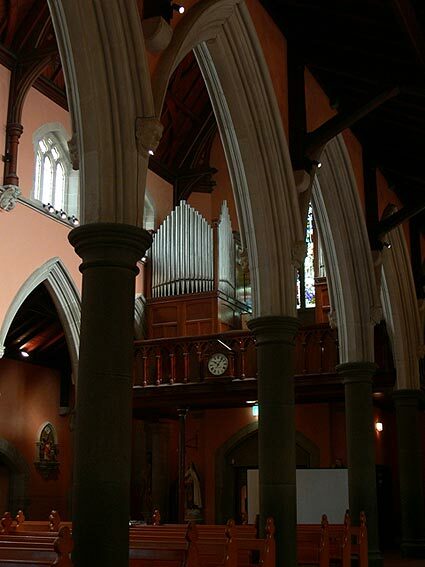 Its tonal design was largely identical to an organ built for St Mary’s Cathedral, Hobart in the following year. Alas, funds were not available to proceed at this time, owing to the financial depression that had gripped Victoria. 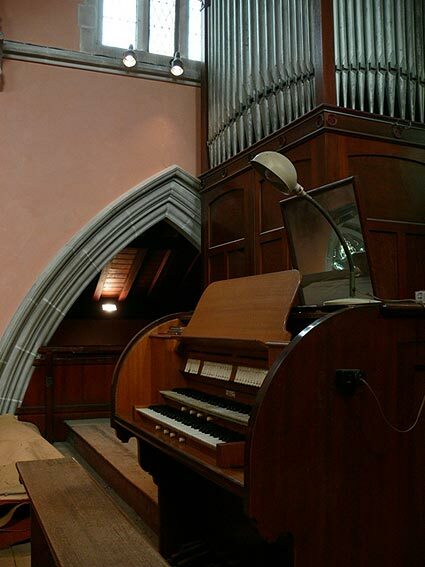 A further estimate was provided by George Fincham & Son in 1909 for a new organ. 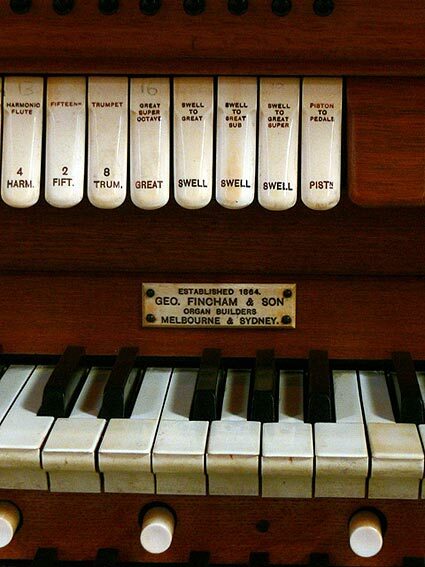 The present organ with 1309 pipes was built in 1924 by George Fincham & Sons Pty Ltd to the specification of Melbourne City Organist, Dr W.G. Price. The firm was awarded the contract in December 1922 for an instrument to cost £1800. The four reed ranks were ordered from Alfred Palmer & Sons, London on 8 January 1923, the Trumpet (scale 4”) unusually for Finchams being of hooded formation. These were voiced on 3½ inch wind, pitch 517. The console incorporated free combination buttons (maybe at the request of Price) and unusual stopkeys pivoted at the top. 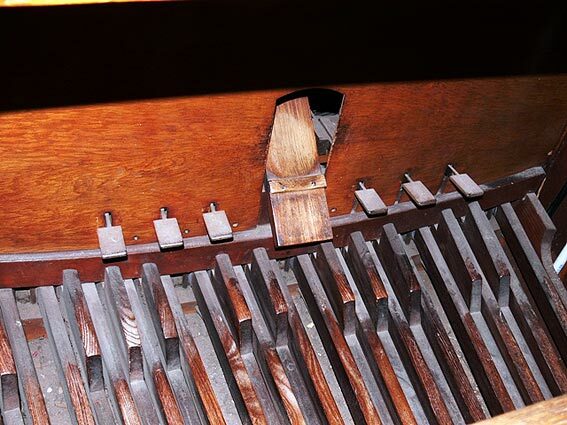 The Great Organ and Pedal Bourdon are placed at the left hand side of the gallery and the Swell Organ and Pedal Open Diapason at the right hand side of the gallery. The detached stopkey console is centrally placed. 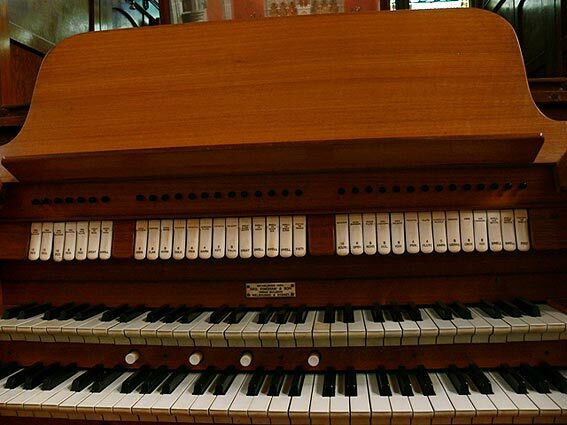 The instrument survives completely unaltered, apart from the addition of a new (and very noisy) blowing plant, retaining its tubular-pneumatic action and voicing. It now requires careful restoration and it is hoped that this will proceed shortly. 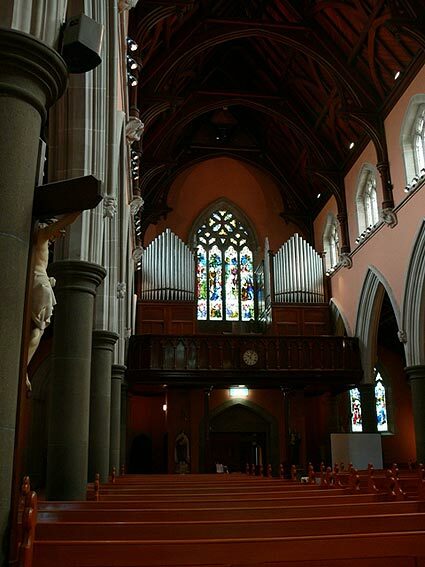 It is the second largest example of the work of the Fincham firm from the interwar years to remain intact, after St Patrick’s Cathedral, Ballarat.